A testing start but it was a successful start for Romania’s Elizabeta Samara, the highest rated player competing in the initial stage of the Seamaster 2016 Women’s World Cup in Philadelphia on the morning of Friday 7th October. 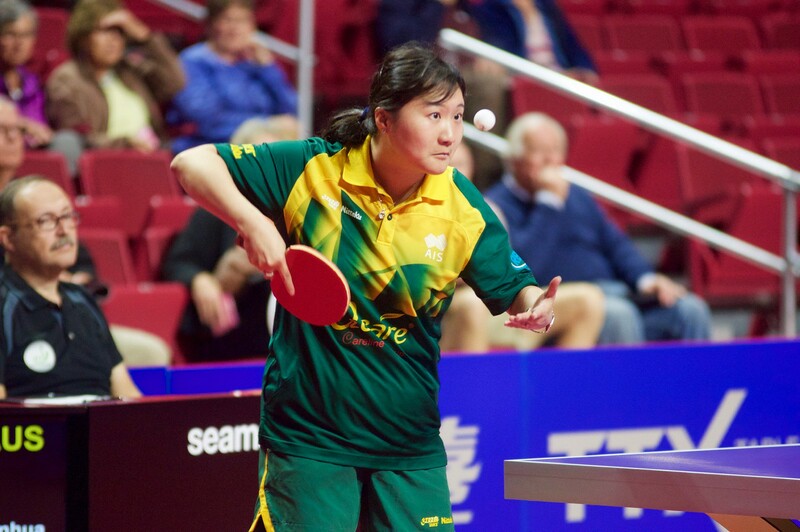 She accounted for the host nation’s Wu Yue in five games (11-8, 11-5, 10-12, 11-8, 6-11, 11-8). Meanwhile, on the corresponding table as matters commenced, Hungary’s Georgina Pota was unrelenting in the splendid setting of the Liaouras Center. Impressively, she beat Australia’s Zhenhua Dederko without the loss of a single game (11-5, 11-7, 11-6, 11-8). The Australian has caused many a player problems with the backhand executed from medium length pimpled rubber; for Georgina Pota it caused no heartaches, the backhand is the Hungarian’s strength and with a few extra degrees of rotation imparted on the ball, success was secured. Peter Teglas is the coach in question. A controlled backhand from Georgina Pota won the day; from Elizabeta Samara it was a lethal forehand against a very spirited adversary who warmed to the task after losing the first two games. Elizabeta Samara is a player who possesses a high skill factor; stay close to the table was undoubtedly the advice from erstwhile coach, Viorel Filimon. Success for Europe, there was also success for Asia; Hong Kong’s Jiang Huajun beat Colombia’s Lady Ruano in four straight games (11-9, 11-3, 11-3, 11-6).